The Diversey H34 Sensisept refill cartridge is a revolution in hand cleaning and disinfecting technologies. The Soft Care Line H34 cartridge fits the standard and the bug blaster wall mounted dispensers seen below. 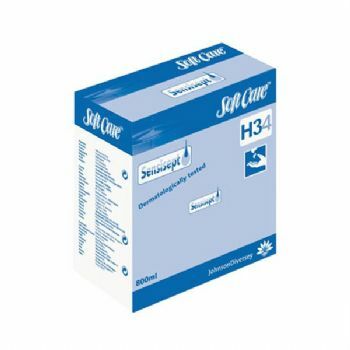 The H34 cartridge is individually boxed as shown and simply slots into the dispenser. Soft Care Sensisept is a highly effective disinfectant with superior mildness. This unique innovative product combines the caring aspect of a cosmetic with the efficiency of an excellent disinfectant.